It is safe to say that things have been pretty rough for a dog named Rosie lately. 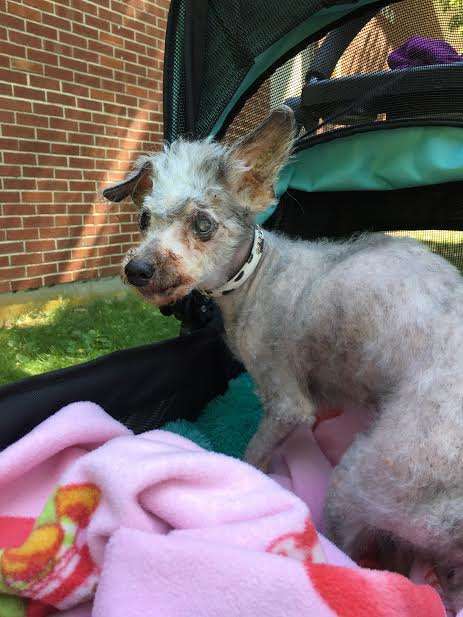 She found herself at the Lowell Humane Society in Lowell, Massachusetts and things did not look so good for her when she arrived. 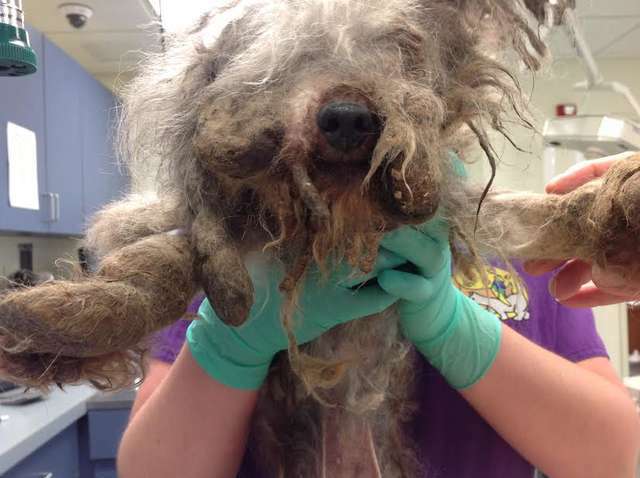 She was literally trapped underneath a very thick layer of old, matted fur and large amounts of dirt and filth. Her eyes were nearly sealed shut with hair and matts and it was also quite difficult for her to walk without pain. Rosie was originally found wandering and living in the woods near Lowell and was quickly rescued by a good Samaritan passing by. They brought her to the Humane Society and staff there couldn’t believe what a sad state the fourteen year old dog was in. It was unclear which part was her tail and which was her head, that’s how terrible she was. It is believed that someone just dumped her into the woods after they realized they could not care for her any longer. 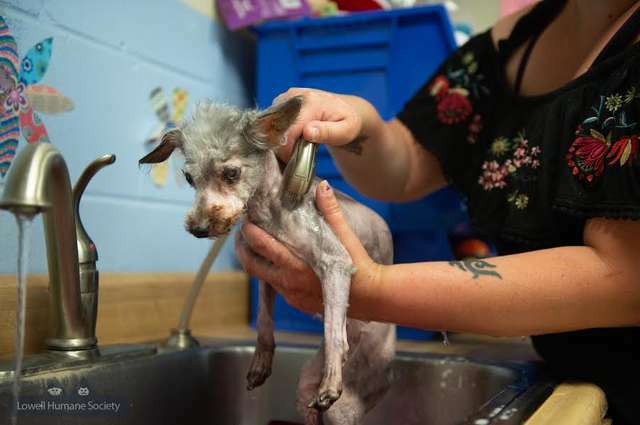 Rosie, who is blind, was actually excited to get a bath and be shaved—she just loves to be around people and truly enjoys affection. Staff says she was very docile, sweet, and calm throughout the entire experience of being groomed. 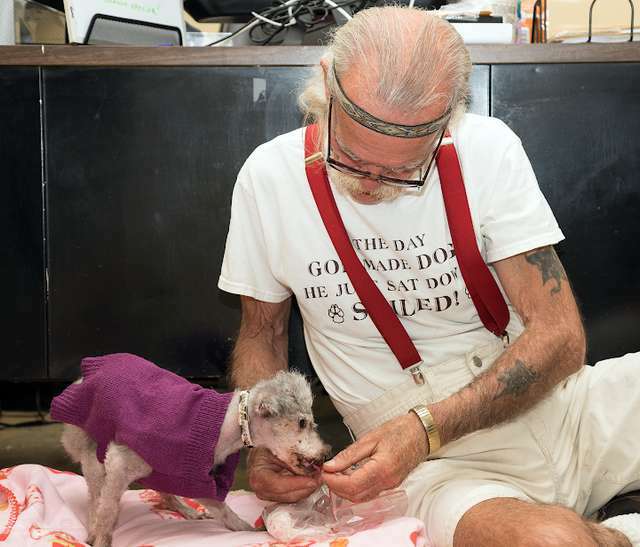 After she was shaved, staff discovered that she had kidney damage and was severely underweight. However, she was still in very good spirits despite her situation. 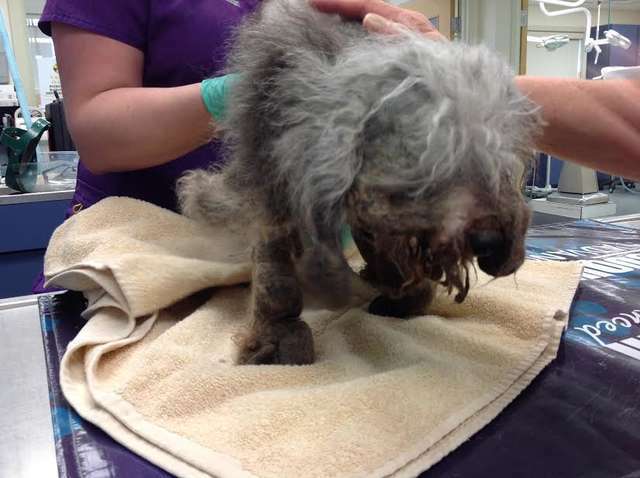 It is believed she lived with her matted fur for over a year, and living in the woods for who knows how long. Rosie is now on a special diet to help her gain weight and gets plenty of time to cuddle and enjoy the outdoors. She is also taking medication for her kidneys. But she was still missing one thing: a family who loves to eat food as much as she does. The staff at the Humane Society say she soon found a new home with three doggy siblings to spend her time with!